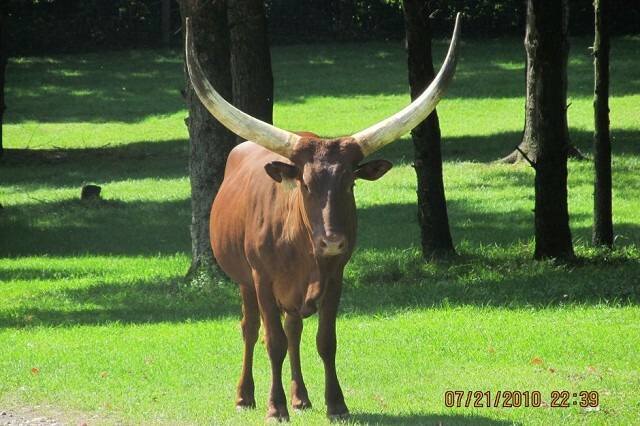 Watusi, also known as Ankole Longhorn,is a breed of cattle originally native to Africa. Its large distinctive horns. The Watisi horns can reach up to 8 ft (2.4 m) from tip to tip are used for defense and cooling by honeycombs of blood vessels. Watusi are able to use poor-quality forage and limited quantities of feed and water. These survival abilities have allowed them as a breed to not only survive the centuries in Africa, but also to become established in Europe, South America, Australia, and North America. The Ankole-Watusi is medium in size, with cows weighing 950–1,200 lb (430–540 kg) and bulls weighing 1,200–1,600 lb (540–730 kg). Newborn calves weigh just 30–50 lb (14–23 kg) and remain small for several months. This low birth-weight makes Ankole-Watusi bulls useful for breeding to first-calf-heifers of other breeds. During the day, the calves sleep together, with an "auntie" cow nearby for protection. At night, the herd members sleep together, with the calves in the center of the group for protection. The horns of the adults serve as formidable weapons against any intruders. Ancient rock paintings and depictions of Ankole-Watusi cattle have been observed in the Sahara region and in the Egyptian arts and pyramid walls.